Some funny and some historic. Many word signs just begging to be in your or a friends train/recreation room! Many more signs under each railroad category. Ferroequinology and Ferroequinologist. Study of the Iron Horse and railroading in general, including model railroading. Grandpas favorite sign: In all things trains, Grandpa RULES.... Pretty much states what we all knew! One of our best selling signs. Grandpas Train Room. 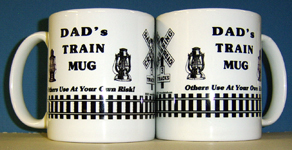 A great gift for every Grandpa train buff. Never a truer saying. We don't stop playing with trains because we grow old, we grow old because we stop playing with trains! Great sign from the early 20th Century found in some very busy train stations during World War II. A coffee mug just for Dear Ole' Dad.... any others use at their own risk. A great gift idea. A coffee mug just for Grandpa.... any others use at their own risk. A great gift idea. Never, but never question the Engineers judgement, small tin sign. CAUTION, model railroader at work. You've been put on notice! DADs train room. A favorite little sign, one of our top sellers. DANGER, model railroader at work. You've been put on notice. An old saying used back when train toilets were flushed right down onto the tracks! Early sign for passengers at the turn of the 19th century to not empty toilet pan out of train window.... you never know who's standing near! A great comical sign. Some Grandmas love trains too! Not all those chasing trains are lost even though it may appear as though they are. 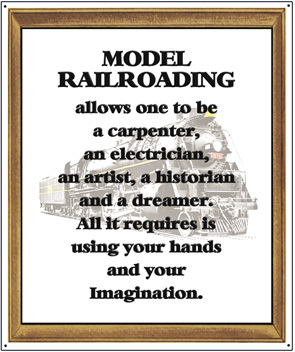 Model Railroader at work, enter at own risk. Great sign for every train room. If you are smoking, you had better be a steam engine..... in others words, NO SMOKING! A great little sign for your layout room, or any other area where there is no smoking allowed. Passengers who snore will be put off at the next station. A cute little sign. Its not my job to ring the bell..........a very famous railroad saying that pretty much applies to every job. 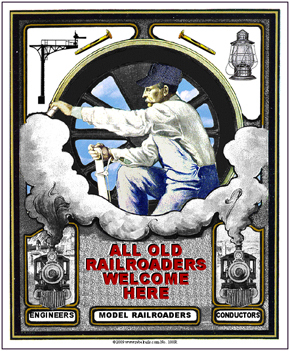 Tin sign Welcoming All Old Railroaders, engineers, conductors, brakemen, model railroaders, story tellers.....Welcome All. A very unique tin sign for every railfan. You can't get cornered in a roundhouse..... no corners! Unique tin sign pointing out the fact that when you stop believing in Santa, you will get underware instead of trains for Christmas! A funny sign explaining why the Engineer is smiling! A sign found in just about every railroad station in the nation. Spitting prohibited on platforms. Still Plays With Trains, a great little sign. Model Trains are much cheaper than therapy and far more fun too. For whatever bothers you, model trains offer satisfying delights. Small tin sign stating what we railfans always do... Think outside the Boxcar.... whats new about that? A great sign for the railfan who thinks he has seen it all. To the trains down to the left. Pointing the way to your model trains. To the trains down to the right. Pointing the way to your model trains. To The Trains Left. Pointing the way to your model trains. To The Trains Right. Pointing the way to your model trains. To The Trains Up. Pointing the way to your model trains. The light at the end of the tunnel could be an on coming train, so watch out!